March was a busy month in the studio. I made a goal to complete a bunch of UFOs that had been taking up space in the closet and I managed to get through 6 of them before having to move on to other projects. The first one was an old project from a Rosalie Dace class 5 years ago. This was a 5 day workshop where we were inspired by the artwork of Paul Klee. This piece was a real favorite of mine until I started machine quilting it. I made the mistake of doing that very heavy quilting in the circle and despite trying everything I could think of to flatten it out, I was never able to. I started hand quilting the radiating lines, then added machine quilting between. I also blocked it like crazy and nothing worked. You can see that I didn't complete the hand quilting on the left side. In the March madness of UFO completion I decided to do the binding and leave it as is. It's wonderfully soft and I still love the design. I'm not sure it will see the light of day, but it's now complete. The second UFO finish is another one inspired by Paul Klee (Little Painting of Fir Trees). This was also from the same workshop with Rosalie Dace. In this case, the top was done except for some organza overlays that I had intended to hand stitch over the top. It was that part that kept me from finishing it, so in the end I just quilted it as is. I think this is more my style and I really like how it came out! Quilt number 3 was this Starry Owl quilt. The blocks were mostly done and I just needed to combine them in to this small community quilt that was donated to the guild. Quilt number 4 is called Autumn Baskets and it's a wall hanging. These blocks were started several years ago when I taught liberated basket classes. All the blocks were finished except for one. I had to frame the blocks and put them together. 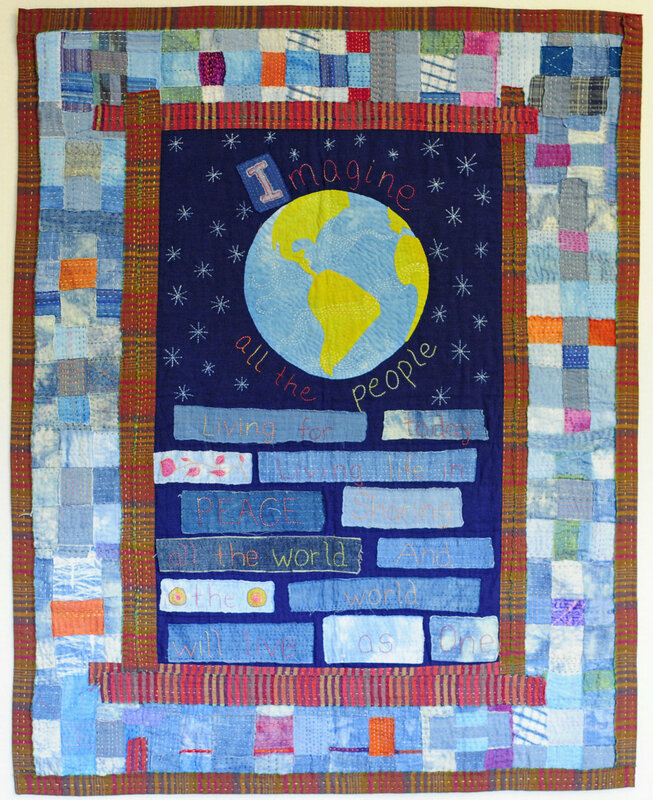 The fifth quilt is another owl quilt and will also be donated to community quilts. This one required more work as I had only the smaller squares that you see above. I added strips to make each block 9.5 inches square. This is a favorite size for charity quilts because I have a 9.5 inch square ruler, so cutting to size is super simple. When I'm making a charity quilt I like to keep things simple and having blocks of consistent size help with that. I know that most people work with consistently sized blocks on a regular basis, but when you are a liberated/improv quilter you are often working with various sized blocks which is fun to do, but requires more time to puzzle together. 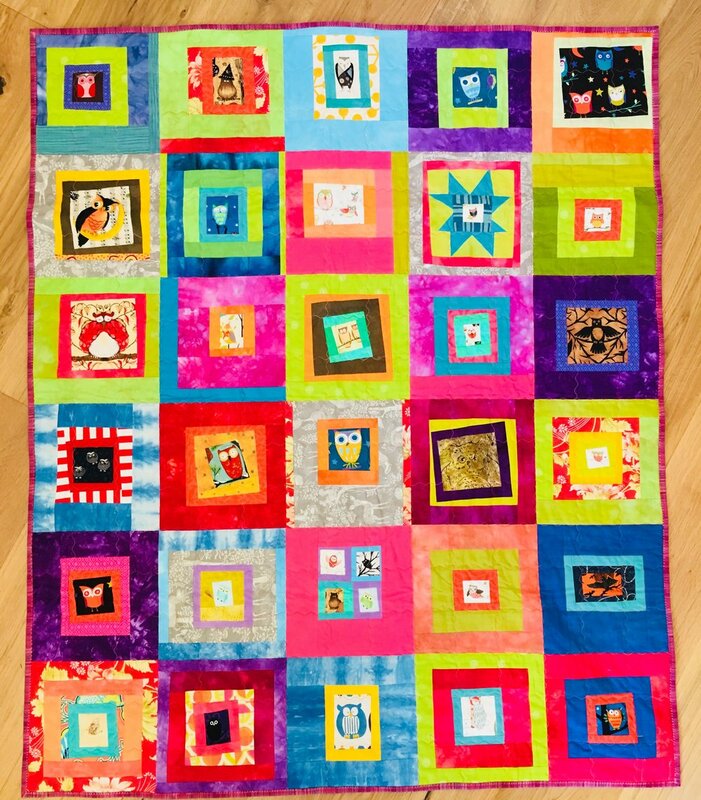 On this quilt I also used many of my most vibrant, rainbow colored hand dyed fabrics. I think these are beautiful, but I almost never use them in my regular work, so I was happy to use them on this bright and cheerful quilt. I hope it brings some cheer to a child in my community. The last quilt for this March madness UFO series is called My Happy Stars. It was made from some star blocks that were already finished. I also had some colorful curvy shapes made with wedge shaped pieces. I ended up cutting those down to rectangles to frame the stars. I really like how this came out and when I showed it on Instagram lots of other people liked it too. In fact, one person asked about purchasing it and I was happy to take her up on it. She even got naming rights! I hope she likes it for many years to come.